Lewis Hamilton rounded off a sensational season for the Mercedes team by claiming his eleventh victory of the season and breaking the record for the most drivers' championship points in a season. Taking advantage of Mercedes' decision to pit under a virtual safety car, Hamilton drove a measured race to resist the cars on fresher tyres, beating Sebastian Vettel and Max Verstappen to the Abu Dhabi win. Equalling his personal best win haul set in 2014, the win also takes Hamilton's 2018 points total to 408, breaking the record set by Vettel in 2013 and becoming the first man to surpass the 400-point mark. Daniel Ricciardo pitted later than most and was given an aggressive final stint, but he was unable achieve his target of securing a podium in his 100th-and-last race for Red Bull. Suffering from excess tyre wear, Valtteri Bottas was forced to make an additional pit stop and finished in a distant fifth place, whilst Carlos Sainz completed his final race for Renault as the 'best of the rest'. His team-mate Nico Hulkenberg, however, crashed out on lap one after a scary barrel-roll, escaping unscathed. Kimi Raikkonen's final race for Ferrari ended in an early retirement after a complete power failure. At lights out, Hamilton got the jump on Bottas to defend his lead into turn one, whilst the Ferraris held their positions just behind. Daniel Ricciardo lost a position to Sauber's Charles Leclerc in the second sector, whilst Max Verstappen had an awful start and fell to tenth. The race was then put under safety car conditions after a frightening roll for Renault's Nico Hulkenberg. With Hulkenberg racing against Haas' Romain Grosjean into the turn eight-nine chicane, the Renault tried to pass Grosjean on the inside of turn eight. With both cars taking a wider line, Grosjean held on around the outside of the corner to attempt a pass on the inside of nine. However, Grosjean's front-left wheel caught the right-rear of Hulkenberg's, sending the Renault barrel-rolling into the barrier. The car landed upside down and Hulkenberg was unable to extract himself from the car. With the car catching fire at the rear, the marshals reacted quickly to prevent the fire spreading, and the car was soon righted so Hulkenberg could free himself. With the race restarting, Verstappen set about trying to recover lost ground, but was hampered by brief power unit issues. Instead, he had to rely on cheekier overtakes into the turn seven hairpin, mostly racing against his Brazilian Grand Prix nemesis Esteban Ocon. This time, the pair just about managed to avoid each other as Verstappen bullishly made his way past the Force India. The race was put under safety car conditions only a couple of laps later, however, when Kimi Raikkonen's final race for Ferrari ended with a complete car shutdown on the start-finish straight. With the race put under a virtual safety car, Hamilton, Leclerc and Grosjean all decided to pit for supersoft tyres and attempt to go to the end of the race. The race resumed with Hamilton down in fifth, behind Bottas, Vettel, Ricciardo and Verstappen, and he immediately attempted to find his way past the Dutchman. 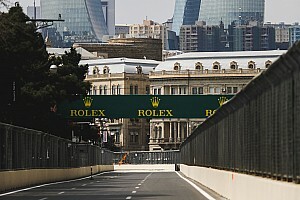 Out-driving and passing Verstappen into the first chicane, the Red Bull man then fought back into the second chicane to hold onto fourth place, and Hamilton was then forced to wait until the pit stops in order to reclaim positions. With Vettel, Bottas then Verstappen all taking turns at pitting for supersoft tyres from laps 15-17, Ricciardo then inherited the lead, with Red Bull appearing to be trying a longer first stint with the Australian. Bizarrely, the outside threat of rain was materialising, and the unlikely scenario of rain in the desert was occurring, although it wasn't enough to hamper lap times too much. Showing solid pace, and managing to keep the gap to Hamilton to no less than three seconds, Ricciardo pitted at the end of lap 33 for the supersoft tyres. He rejoined in fifth place and eight seconds behind his team-mate, albeit with much fresher tyres. In the meantime, the gap between Bottas, Vettel and Verstappen had gradually reduced, and a mistake from Bottas gave Vettel the golden opportunity to take second place. Bottas locked up into turn six and ran wide, compromising his run down the first long straight. 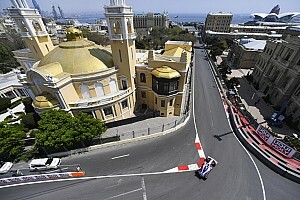 Vettel gained a slipstream, attempted to pass down the first chicane before completing the move into the second chicane. The Finn was then under pressure from Verstappen and, after rudely cutting the chicane in order to keep his position, was passed by the Red Bull into the tight turns of 11-12-13, with Verstappen forcing his way through. Unable to cope with the fresher tyres on Ricciardo's car, Bottas was then passed one lap later by the second Red Bull, which prompted Mercedes to pit him for a new set of ultrasofts. Further ahead, Vettel was gradually chipping into Hamilton's race lead, and was five seconds behind with ten laps to go. Verstappen was a further three seconds adrift of Vettel, and Ricciardo was another two seconds behind him. With all four drivers matching each other lap for lap, there were to be no final duels in the closing moments of the race, and Hamilton was untroubled in taking his eleventh win of the season. Vettel took second ahead of Verstappen, whilst Ricciardo finished just short of a farewell podium in his last race for Red Bull. Bottas finished a distant fifth, Carlos Sainz ended his final race for Renault as the best of the midfield, with Sauber's Charles Leclerc fending off Sergio Perez's Force India for seventh. The Haas pairing of Romain Grosjean and Kevin Magnussen finished ninth and tenth. In Fernando Alonso's final race in Formula One, he was unable to quite catch up to the final points-paying position, and took a five-second time penalty for cutting the chicane in his efforts to close the gap. He finished in eleventh place, and cruised around in a formation cool-down lap along with fellow world champions Hamilton and Vettel. Who was your driver of the day in Abu Dhabi? Leave your thoughts in the comments section below.